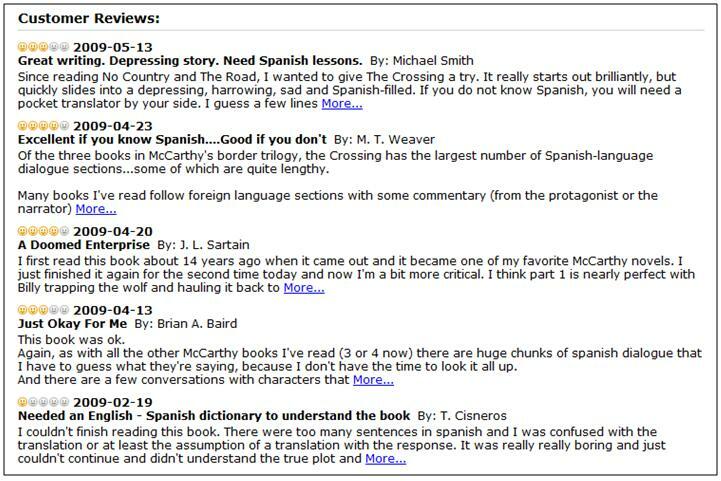 When was the last time you came across a new or used book Web site or hotel aggregator site that didn’t offer consumer reviews? Would you go back if that was the case? Probably not, since user reviews are now the price of entry for any Web site that sells a large number of similar products or services. It used to be that sites like Amazon.com and TripAdvisor were lauded for their user review systems. Epinions built an entire business around consumer-driven product reviews. Although the initial buzz has turned to quiet praise, why have so many sites continued to adopt user reviews? Likely because users began to expect – and then demand – user reviews. 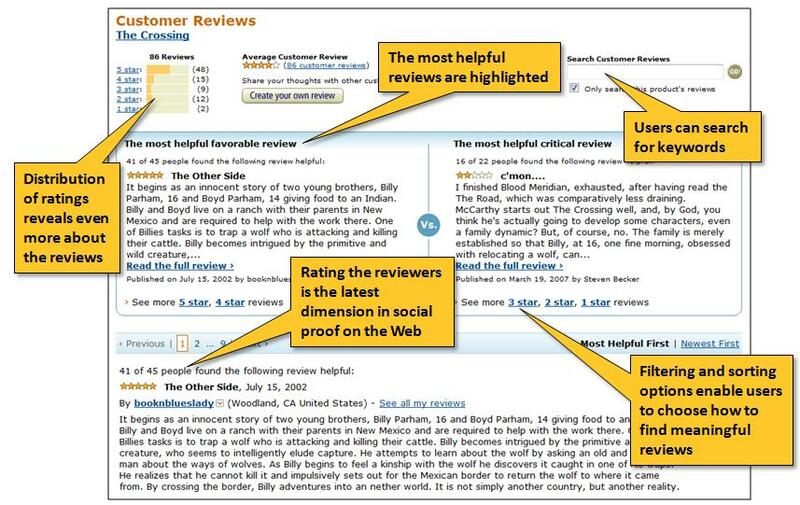 But did you ever stop to think about what drove this expectation and why user reviews are so powerful? Do we really follow the crowd (sometimes to our own detriment) when making important decisions about where to spend our money? Yi-Fen Chen conducted a study in 2007 titled, “Herd behavior in purchasing books online” that examined recommendation systems and their impact on consumer behavior. So the Web has created too many choices for us (no revelation) – choices that may have always existed but never been fully exposed. Students of persuasion know that with an increasing number of choices, decisions become more difficult to make. And that’s a core benefit of user reviews: they are intended to make decisions easier for consumers, and the prevalence and popularity of reviews would appear to indicate that this is a real outcome. I interpret this to mean that we (i.e., humans) don’t like to expend too much energy on making decisions. And when you consider just how many decisions we are forced to make in a single day(! ), it’s no wonder, really. In fact, it’s this desire to make it through the hundreds of daily decisions and still have the energy to eat, talk, laugh, exercise, and play with our kids that is largely responsible for the study of persuasion – as so many of the persuasive principles we’ll discuss on this blog relate to our moving through life on ‘auto pilot’ – and how understanding this behavior can work for you and your Web business… to compel people to reach for their mouse and make the next click. As consumers come to rely even more on reviews in their complicated purchase decisions, cues such as these are quickly becoming part of what users expect to find on all Web sites. It’s no longer enough to provide a simple star rating. Users want more. Her first point about expert reviews being potentially more influential is countered by the other two excerpts. I interpret them to mean that if a book has 5 expert reviews and 5 consumer reviews, people will lend more weight to the expert source. However, when the number of reviews by end users exceeds the volume of professional write-ups by a reasonable margin, there is power in numbers – and the numbers tip the influence in favor of the laypeople. Chen’s final point about similarity is also insightful (and relates to another persuasion principle known as likeness), but I don’t see it being put into widespread practice by e-commerce sites. However, ratings and reviews vendor Bazaarvoice does offer the option to profile reviewers to its customer base, probably knowing full well that review readers will assign more credibility to people that appear to be just like them. With only a brief scan of its product pages, it’s pretty clear that Amazon understands consumers and what they have come to expect from an e-commerce site. And with an average annual conversion rate north of 15%, the company also has a firm grasp on the principles of persuasion and specifically the power of social proof.